Google Cloud is launching a new feature today that will give its users a new way to monitor and optimize how their data flows between their servers in the Google Cloud and other Google Services, on-premises deployments and virtually any other internet endpoint. 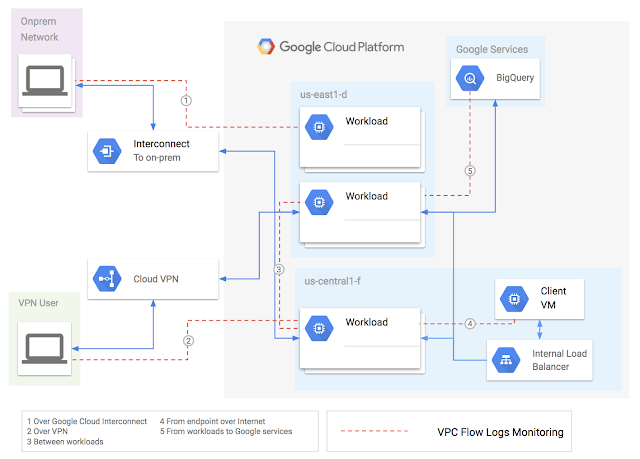 As the name implies, VPC Flow Logs are meant for businesses that already use Google’s Virtual Private Cloud features to isolate their resources from other users. VPC Flow Logs monitors and logs all the network flows (both UDP and TCP) that are sent from and received by the virtual machines inside a VPC, including traffic between Google Cloud regions. All of that data can be exported to Stackdriver Logging or BigQuery, if you want to keep it in the Google Cloud, or you can use Cloud Pub/Sub to export it to other real-time analytics or security platforms. The data updates every five seconds and Google promises that using this service has no impact on the performance of your deployed applications. As the company notes in today’s announcement, this will allow network operators to get far more insight into the details of how the Google network performs and to troubleshoot issues if they arise. In addition, it will allow them to optimize their network usage and costs by giving them more information about their global traffic. All of this data is also quite useful for performing forensics when it looks like somebody may have gotten into your network, too. If that’s your main use case, though, you probably want to export your data to a specialized security information and event management (SIEM) platform from vendors like Splunk or ArcSight.